Learn the basics of shooting a compound bow. We will be shooting at large target blocks on a secure range. This is a great way to get outdoors, learn something new! Good for ages 8 and up (depending on strength level). Reservations are required by calling the park office. $10 plus $5 parking. 912-727-2339. 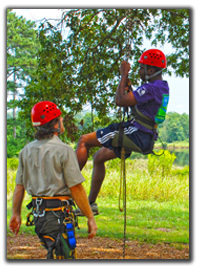 Our first week of camp will begin June 10th -14th, 2019, and is for Junior Rangers ages 6-9. Junior Rangers will discover more about Georgia's great history, march through the woods and marshes, learn about the environment, archery, and become stewards of Georgia's natural and environmental wonders! Please register early to secure your spot. $100. 912-727-2339.